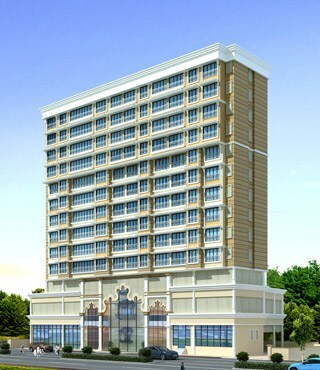 Buy flats in Santacruz at Mayfair Heritage. 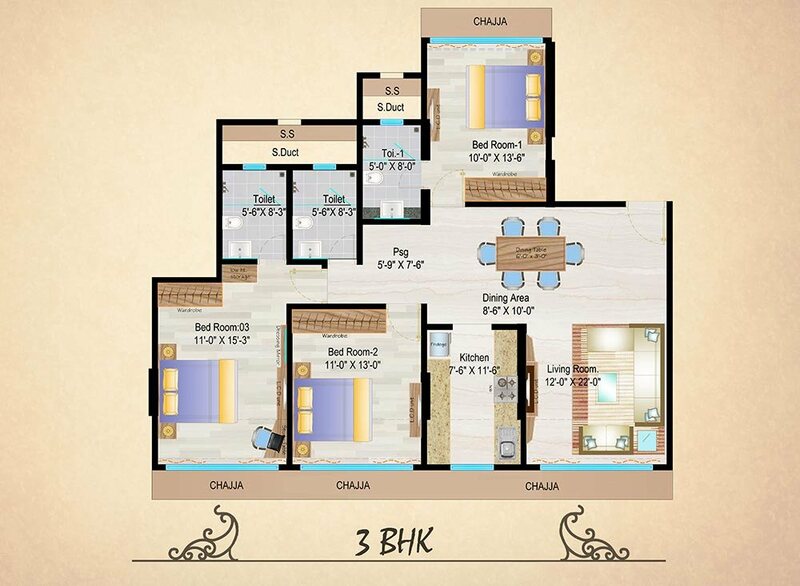 Uplifting your standards, these 2 BHK & 3 BHK apartments in Santacruz will surely impress you with it’s design. Mayfair Heritage is by far one of the best residential project in Santacruz, Mumbai developed by Mayfair Housing that offers well designed luxurious flats in Santacruz west that amazingly escapes the noise of the city without compromising on quality standards. 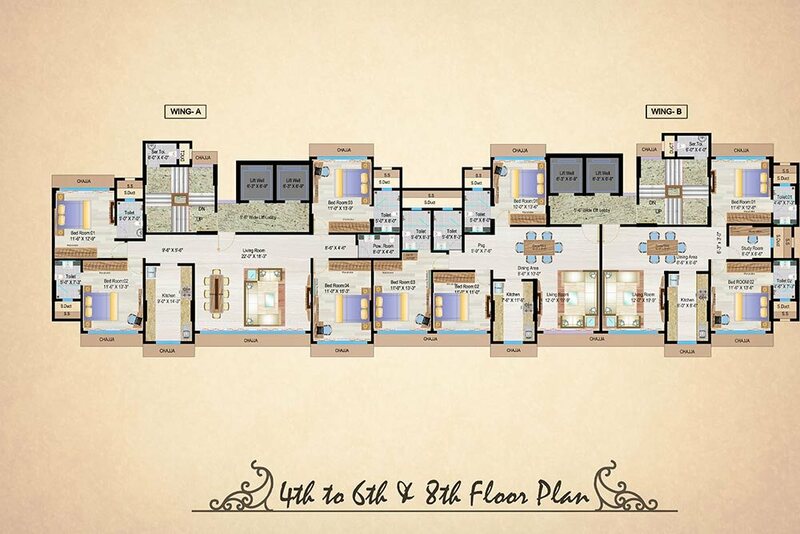 It is a home to thoughtfully blended contemporary styled apartments with a princely old world setting. This building is a consistent amalgamation of solace and style that's wonderfully crafted bearing in mind all your needs. Home buyers can be sure that the price of Mayfair Heritage is economical for anyone looking to buy property in Santacruz. With superb ventilation, uncluttered wide space Mayfair Heritage is definitely one of the best new projects in Santacruz that's ideal for home buyers looking to buy reasonably low budget & cheap flats in Santacruz. Bookings are open at Mayfair Heritage for ready possession flats. 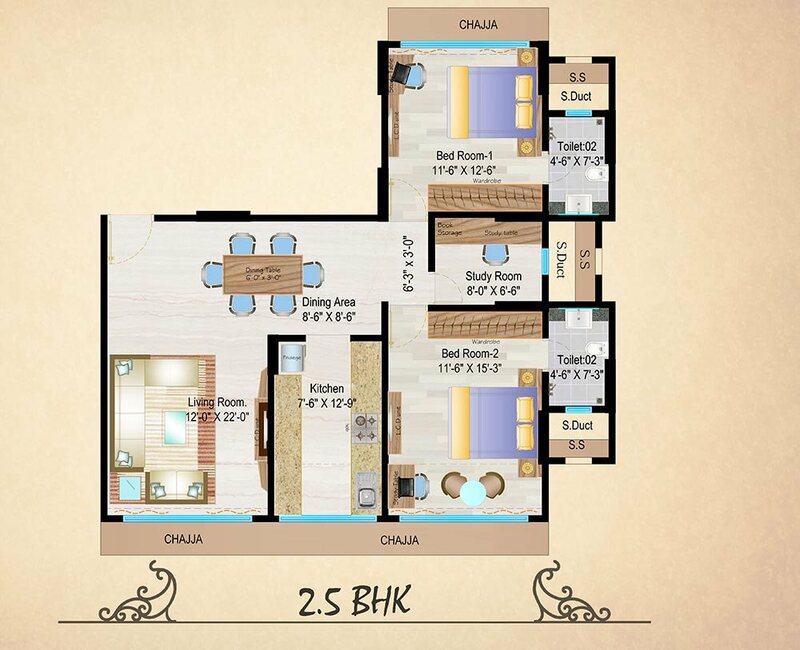 So hurry up and book a 2 BHK & 3 BHK flats in Santacruz at Mayfair Heritage & live in one of the cosiest and most coveted locations in the Mumbai. The grandiose of the high ceiling lobby with its resplendent appeal is designed to embrace elegance and grace. Step into the luxury of centrally air conditioned lobby with tastefully designed reception and waiting lounge adorned with plush furniture. 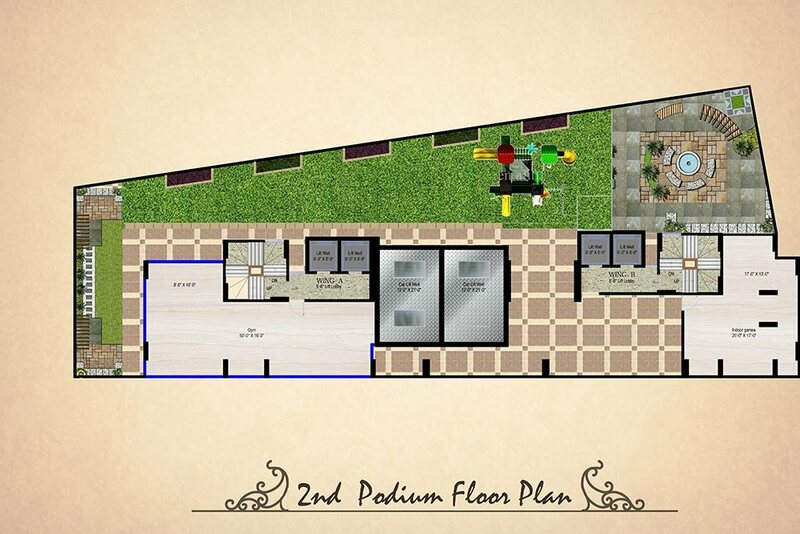 A perfect extension of your private lounge to greet and meet your guests in a semi formal ambiance. The lobby with its luxurious appeal is designed to embrace opulence and grace. Its fully air conditioned with reception and waiting lounge decorated with chic and classical furniture, where you can relax and experience a feeling of another world, away from modern world. Tone your body and mind in the fully equipped, state of the art gymnasium. Marvel at the city views while you enjoy your work-out in the gym allowing you complete flexibility to be as active or as relaxed as you desire. A fitness space designed only for a select few. Enjoy the stunning views of the horizon from the beautifully landscaped podium garden with expansive sights of the city at your delight. The sweeping glances and the tranquil surrounding will surely take your breath away. A stroll along the terrace garden is a calming start to your day or a romantic stroll to unwind your evenings. The garden is fully landscaped with lawns and decorated with hard paving, soft paving and lights right under the open sky. 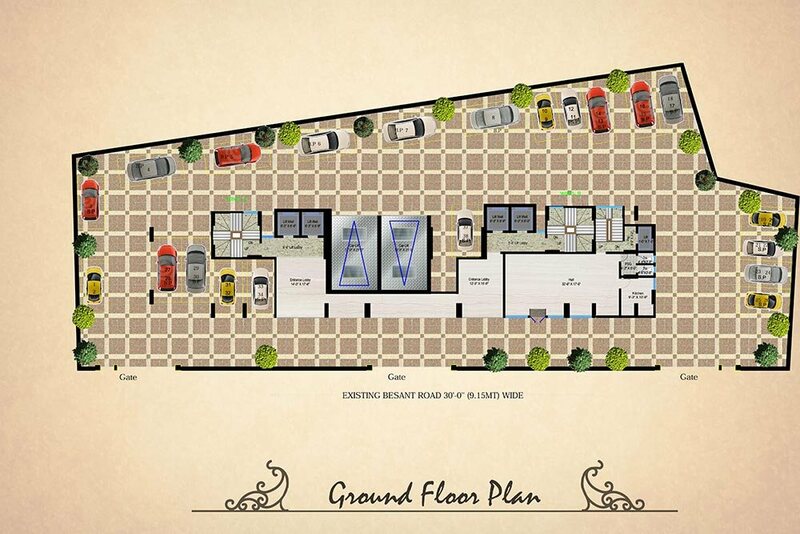 Get a spacious, exclusive and one of a kind space to comfortably park your car. 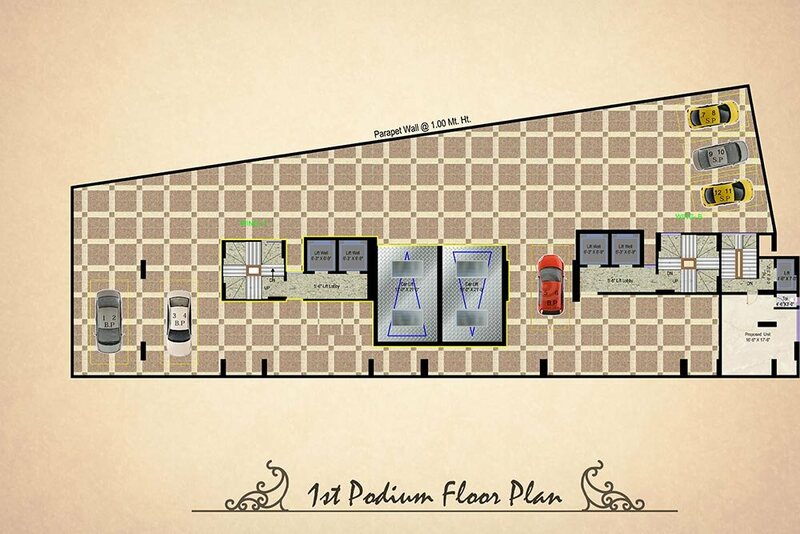 The car park zone is fitted with hi-tech car lifts that increases accessibility with ease. The parking and drive way is elegantly laid out with hard yet decorative paving tiles to blend well with the overall aesthetics. All bedrooms, bathrooms and the kitchen have been designed with a heart. 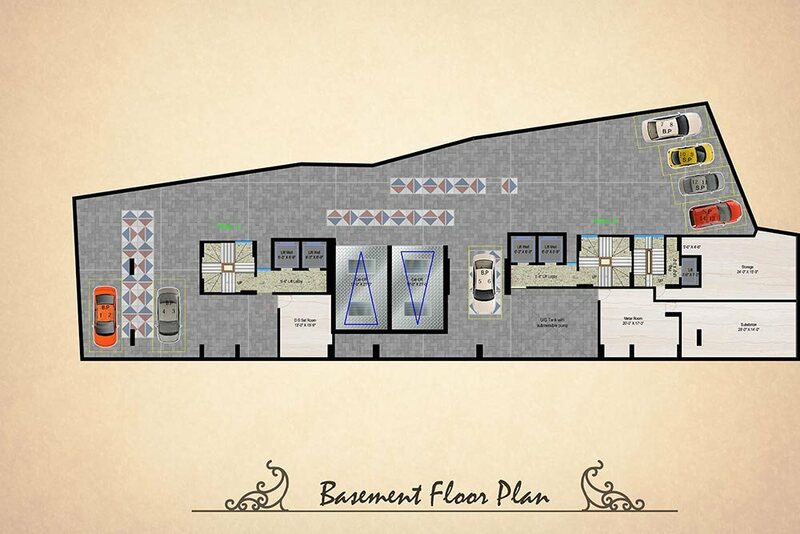 The right mix of spacious and functional layout makes it just perfect to accommodate your needs more lavishly. Space optimization has always been a hallmark of Mayfair’s architecture. So, find more space and more luxury in a relaxed setting, called home. Your home starts from a height which sets it above the rest with an un-obstructed panoramic view. A rare luxury in Mumbai. The lavish apartments are beautifully laid out to optimize space and to ensure generous flow of natural lights. Add to this is a touch of hi-end quality finish that you find in everything. Be it opulent fittings, chic flooring or glass partitions, wall tiling- the mark of uncompromising quality is evident everywhere. The sheer beauty of your abode in Heritage is the panoramic view of the city’s skyline. The spectacular views of the horizon lets you embrace the magnificent location and experience serenity while you marvel at the city views. Italian Marble OR Composite Italian Marble flooring in living, dining and family area. Italian Marble OR Composite Italian Marble in all bedrooms. Composite marble flooring in Kitchen area. Parallel Granite Kitchen Platform with SS Sink. Dado up to 7ft. height in kitchen will be of designer Ceramic Tiles. Provision of point for water purifier. Interior: Luster on walls, Acrylic Emulsion on Ceiling. Exterior: Maintenance free texture paint. over Texture surface. One MCB (Miniature Circuit Breaker) for each room at the main distribution box with ELCB (Earth Leakage Circuit Breaker). TV point & cable point each in the living room and in all Bedrooms rooms. Adequate 5A & 15A switch sockets. Telephone points in all Bedrooms, Living Rooms & Kitchen. 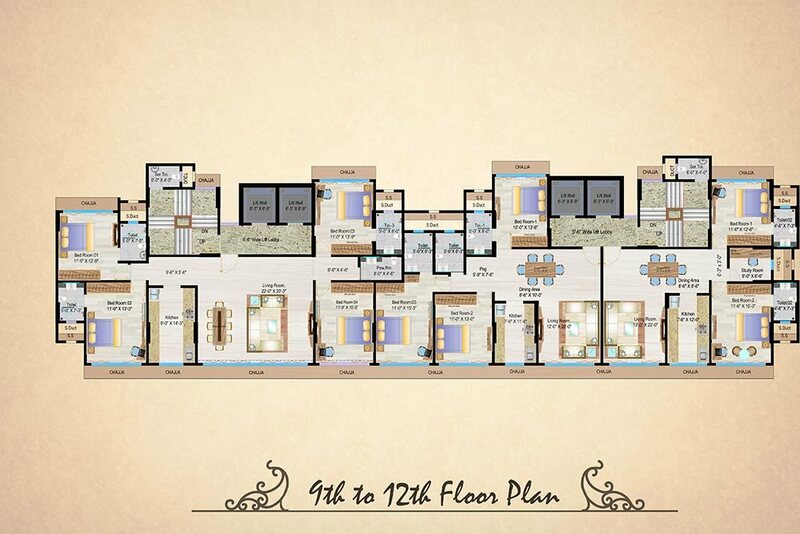 Intercom System for entire building with all flats, Entrance Lobby, Security Cabins. Colour Video Door Phone for every flat. Two High Speed elevators of reputed make. Entrance Lobby – Grand & Elegant. 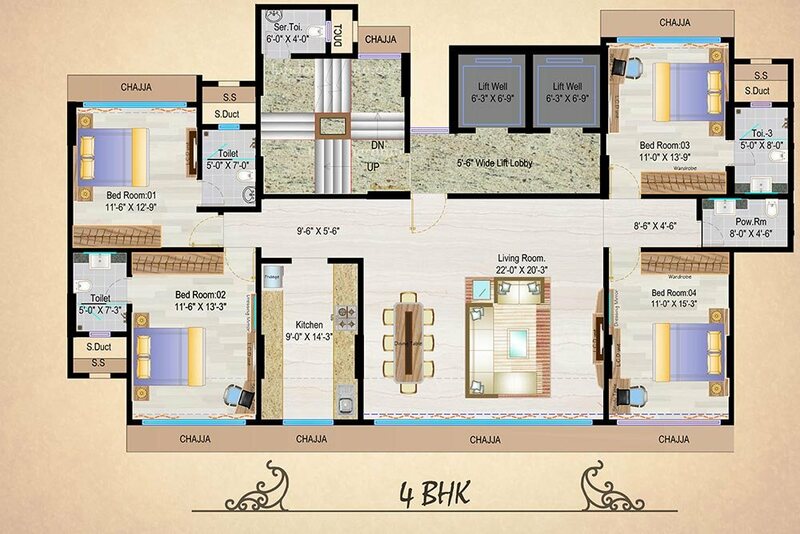 Italian Marble flooring and Dado in one Master Bedroom toilet up to false ceiling or 7 ft. height. Ceramic designer tiles combination flooring and dado in all other toilets up to false ceiling (7 ft. height). European WC in all toilets of reputed make. Shower Panels of reputed make with tempered glass partition will be provided in Master Bedroom Toilet. All wooden door frames will be in Melamine Finish. Flush Door shutters will be provided in Main Door & all Bedrooms. Main door will be finished with Moulded Veneer on one side & plain veneer on other site. All Bedroom Doors will be plain veneer finish. All rooms will have Aluminum powder coated / anodized Windows. Water resistance FRP door shutters will be provided in Toilets. Brass Finish Aldrop, Night Latch and Handle will be provided for all Main Door. All internal walls are with POP plastering. Ceiling in all rooms finished with Gypsum excluding Living area. Concealed UPVC / CPVC plumbing with concealed cistern. Basement and Podium Fixed Stack Car Park.